Laura, or Scenes from a Common World, an original work from Square Top Theatre, explores the borderlands between film, theatre, dance, literature, and the contemporary fine arts. Laura combines visceral physicality, lyrical poetry, and evocative cinematography to explore one woman’s struggle to make herself at home in the world. Her struggle begins as a common one. A boy has left her. In losing him, she becomes less sure of the roles other people play in her self-creation. She seeks security in isolation only to find that landscape, community, and physical embodiment all ground who we are in ways she cannot escape. In this spare five-part drama, inspired by Ovid’s Apollo and Daphne myth, audiences see Laura seeking freedom by running away from the world, yet finding freedom, ultimately, in rootedness. While remaining grounded in the narrative of Laura’s struggle, the film unfolds as a cinematic poem with colliding images, words, and evocative physicality. This is a film that invites audiences to complete the creative act. Poet Anne Micheals notes, “not two to make one, but two to make the third, just as a conversation can become the third side of the page.” We invite audiences to share in this conversation. 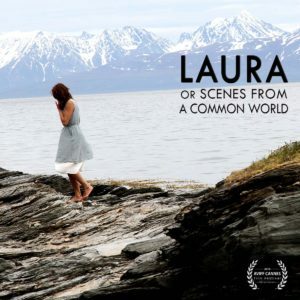 We hope viewers will pause to contemplate as Laura stops to connect with the Northern landscape and the common world around her. The project draws together artists from across the globe. Theatremaker Charles M Pepiton (USA/Washington), poet Damon Falke (USA/Norway), and artist Wes Kline (USA/New Mexico) previously collaborated on Square Top Theatre’s Now at the Uncertain Hour, a theatrical event for live performance, online streaming, and broadcast radio, which reached a combined live onsite/offsite audience of 46,053 in its premiere performance. For Laura, this team will be joined by printmaker Rebekah Wilkins-Pepiton (USA/Washington), costume designer Leslie Stamoolis (USA/Washington), performer Alexandra Kazazou (Greece/Poland), and movement director Daniel Han (USA/Australia). The film was shot and the physical work was composed in Tromsø, Norway, where the interaction of elements symbolically significant for the piece – water, fire, earth – are dramatized by the land itself. The film runs 36:22. In Norway, Laura finds the “acres of redemption” she seeks. She discovers that she must create her life out of what the world gives her – a boy picking apricots, an old woman shaping a boat, a father, a river, a stone. Laura named “Best Experimental Short” by Cinema on the Bayou! An official selection of Cinema on the Bayou in Lafayette, Louisiana (Jan 25-Feb 1, 2017). Laura screens on Sunday, January 29 at 9:00pm at Acadiana Center for the Arts. STT’s Charles M Pepiton and Wes Kline will participate in a panel discussion that afternoon. “On Listening” by playwright Damon Falke at HowlRound. This project is made possible, in part, through a grant from the Network of Ensemble Theaters’ Travel & Exchange Network (NET/TEN), supported by lead funding from The Andrew W. Mellon Foundation and the Doris Duke Charitable Foundation.